Rough & Tumble: This next cinematic chapter in the 007 series is an actual sequel that finds Bond hell-bent on revenge for punishing those responsible for unleashing his internal demons. The action begins immediately with Bond being chased by auto assassins. The theme title, "Another Way To Die", marries composer Jack White with vocalist Alicia Keys in a contemporary piece uncommon to the characteristic Bond catalogue. Their vocal duet is a first in the 22 Bond film series. The 007 single topped the charts in Finland. The death sceen wherein Bond discovers Ms. Fields has met her demise is a rip-off right outta Goldfinger from 1964. Her lifeless naked body is found drown in oil atop the bed. Copy-catting this icon film sceen from that blickbuster Bond flick was strangely unnecessary. Daniel Craig was back as Bond 007. Olga Kurylenko was his partner in revenge. The two were determined to complete their objectives without mixing physical pleasure with deadly business. Mathieu Amalric played the evil eco-unfriendly Dominic Greene. Joaquin Cosio is the exiled General Medrano. Although not fully identified, Gemma Alerton protrays Strawberry Feilds, an MI6 agent stationed in Bolivia. Judi Dench has an expanded role as M. Jeffery Wright reprises CIA agent Felix Leiter. 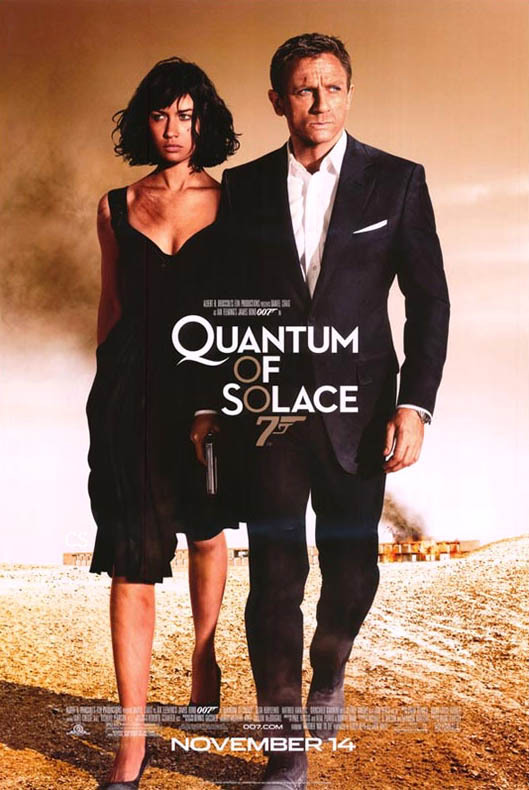 Giancarlo Giannini returns as Rene Mathias who befriends Bond following the loss of Vesper. The Quantom of Solace Gala Preview featured multiple theaters in use to accommodate the capacity crowd that turned out for the film preview. Attending guests were treated to champagne and delicious fruit. The blackberries were particularly yummy. Mini handheld gift bags made of 51% recycled fabric from Johns Hopkins Medicine were distributed to media guests producing VIP invitations. Knickknacks included a water bottle, a pen, a blinking red heart, sunscreen lotion, a chocolate bar, and a dual compass & magnifier.